IBA Centre for Excellence in Islamic Finance (IBA CEIF) is pleased to offer a two-day intermediate level course on Trade Finance. 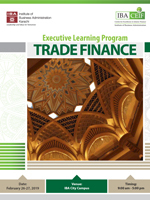 The course is aimed at exploring key trade finance products, techniques and compliance issues. It provides practical, in-depth analysis of international trade and commodity finance. It examines the conflicting needs of importer, risk mitigation and working capital solutions for both parties. The training will also cover the latest developments in technology and how it is expected to transform the business of trade. The workshop will be led by Trade operations experts as well as Shariah experts enabling participants to have a comprehensive understanding of trade finance instruments and financing structures used to facilitate commodity flows.